“We are celebrating our second annual family Oktoberfest this year and I am looking to add this barrel carving as a part of the festive decoration and also commemorate my mother and the town she was from in Germany. I’m hoping to add a new barrel every year and very excited about this first addition. Thomas’s design input consisted of an image of a family crest, along with some commemorative text he wanted carved on a tenth barrel head, along with an antique brass spigot. Per our usual process we iterated on a design proof with him and produced a beautiful barrel carving. We also made a video of the production of the carving and integrated that with video Thomas shot of the unveiling at his Oktoberfest celebration. 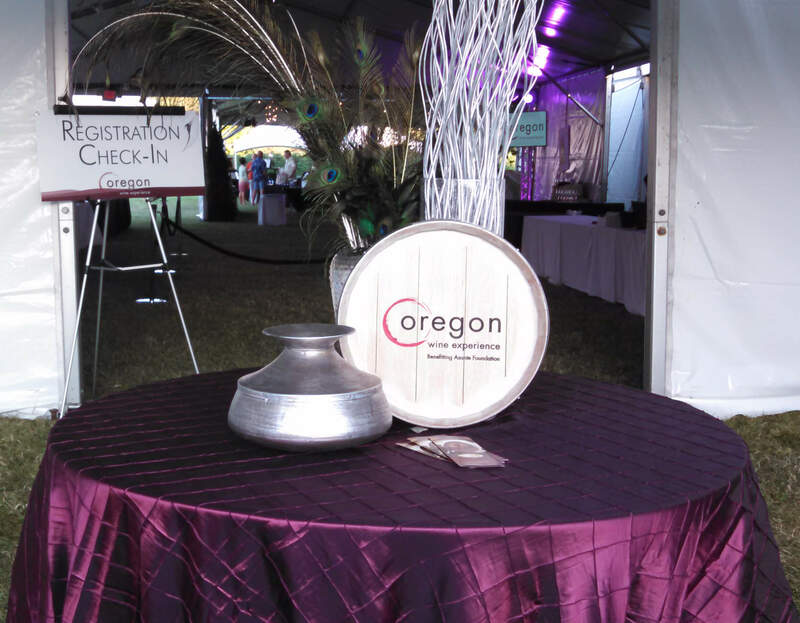 The annual Oregon Wine Experience, formerly known as the World of Wine, is being held this week (August 17-23, 2015) at Bigham Knoll in Jacksonville, Oregon. Over 50 southern Oregon Wineries and hundreds of wine lovers participate in a series of events, classes, competitions, dinners and tastings spread out over the week. It is sponsored by the Southern Oregon Winery Association and Asante Foundation, and is a benefit for Children’s Miracle Network and other healthcare programs supported by Asante. The kickoff event is a first of its kind “barrel auction” where full barrels of wine donated by several wineries are auctioned off after attendees experience a “barrel tasting” directly from the barrels. 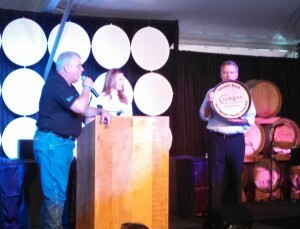 Some of our products were front and center at the barrel auction event. An Oregon Wine Experience logo’d barrel sign is shown prominently displayed at the entrance to the event below. 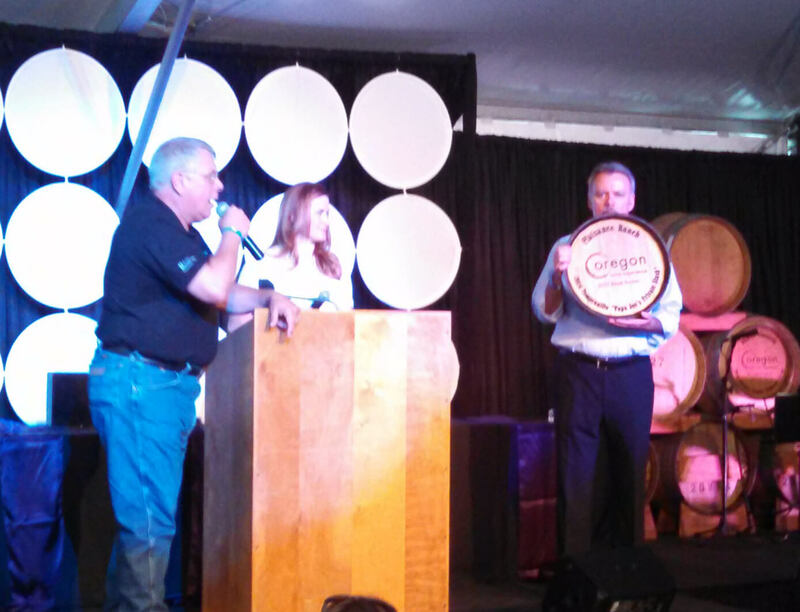 We also provided a carved and painted sixteenth barrel carving with the name of the winery and the wine for each of the auctioned wine barrels, which was used in the auction to identify the wine being auctioned, and also given to the winning bidder. Another interesting form of barrel art was on display at the event. Several artistically painted whole wine barrels from a number of local artists decorated the venue to be auctioned off later in the week. These barrels were on display in various locations around the Rogue Valley leading up to the event. “Heraldry” is the practice of designing, displaying, and recording coats of arms and related badges. It originated in the Middle Ages out of the need to distinguish knights and other combatants when their identity was hidden by armor. Over time, a formal system of rules spawned a wide variety of forms of heraldic art. Though heraldry dates back to 12th century Europe, it is still very much in use today by many countries, cities and towns, as well as organizations and families around the world. Heraldic societies exist to promote education and understanding about the subject. Today we’re seeing a resurgence of interest in heraldry, due in large part to renewed interest in family history and ancestry. Lovers of fine wine and food often savor the rich, authentic atmosphere in which they are enjoyed as much as they do the food and wine. One example of this is the new wave of wineries that now serve fine food with their wines in a refined, “working winery” environment. Here guests are surrounded by large oak wine casks and barrels, and other tools and symbols of the art of wine making – often inside an operating wine cave or cellar. Hospitality designers and owners can bring that same ambiance into the dining rooms and bars of restaurants and clubs with a combination of authentic looking wine cask reproductions and surroundings that evoke the feeling of a working winery, such as this bar room wall at Fogo de Chao Brazilian Churrascaria in Chicago. Isn’t every carving inherently 3 dimensional you might well ask ? Well, yes, in the sense that carving into any material results in a surface with at least some depth, and therefore at least some 3-dimensionality. However, the distinction we’re making here is between a carved surface that is comprised of curves in 3D space, versus one comprised of lines or pocketed areas carved into a flat surface. This Dragon’s Head Pub barrel head carving incorporates examples of both. The intricate celtic weave border is 3D, while the dragon and text are 2D. Lets look into both of these styles of carving a little deeper, especially as they apply to decorative wood carvings. There’s no better or more practical way to add a big authentic piece of wine country décor into a home or business than with a wine barrel clock. Being large and round, wine barrel heads are the perfect raw material for making truly unique, large wooden wall clocks. For those who love wine, wineries and the whole wine country experience, there’s an almost irresistible urge to bring some of that ambiance back into their home wine bar or cellar, or wherever they enjoy drinking wine with friends and family. And for wine-oriented businesses like wineries, tasting rooms, wine stores and restaurants, nothing makes a bigger statement to the wine enthusiast than a wine barrel head clock with their logo beautifully carved on the face. Wine barrel clocks are available from a number of sources, including the “do-it- yourselfer”, in a very wide variety of looks and styles. They range from very basic and rustic (perhaps just the unfinished flat head of the barrel with a simple stenciled clock face), to stunning hand painted 3d relief carvings of wine and grape themed artwork on a full eighth or “tenth” barrel end, to gorgeous carvings of a wine business logo – all with a variety of clock face styles. 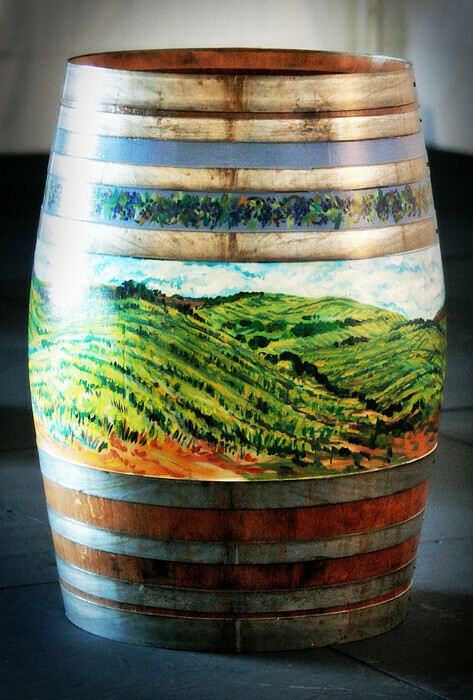 “Wine barrel art” can be defined as the broad range of aesthetic objects made from wine barrels through an artisan’s skill and creative imagination. These objects make natural elements of a “wine décor” for decorating and accessorizing wineries, tasting rooms, bars and restaurants, as well as home wine cellars and bars. In this article we provide a brief review of wine barrel art – focusing on its origins in the old world folk-art of barrel carving. In Part 2 of this article we will provide an overview of the wide range of artisan products made from wine barrels today.